Aeronautical charts show several types of special-use airspace. Pilots need to know about these for flight planning. In general, if it's outlined in blue ( ), plan to avoid the airspace. Magenta ( ), not so much. The altitudes of these areas, and when they operate, are shown in tables in the margin of the chart. Unlike in the Chart Supplement (A/FD), these times are local time. 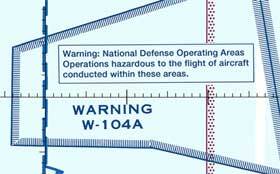 The dagger (†) means "other times by NOTAM." 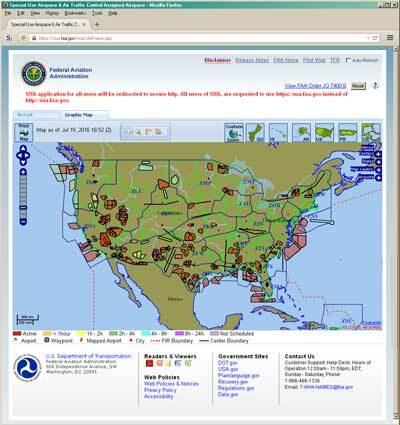 The FAA maintains an interactive web site, http://sua.faa.gov, to track special use airspace. You can zoom and pan with familiar controls to the left of the map. Click within an area to see its schedule for the next 24 hours. If you block pop-ups and scripts, you will need to enable them for this site to work. Prohibited Area. Prohibited Areas are established to protect extremely sensitive sites like the White House or Camp David. Don't even think about flying there. If you are allowed to be there, you already know it without reading this article. Restricted Area. Restricted Areas contain unusual hazards such as artillery firing and aerial gunnery. Hours are often limited, especially at night and on weekends. VFR and IFR aircraft may not operate here without clearance from the controlling agency. When the area is not active, VFR traffic may fly through, and IFR traffic may be cleared for routes here. 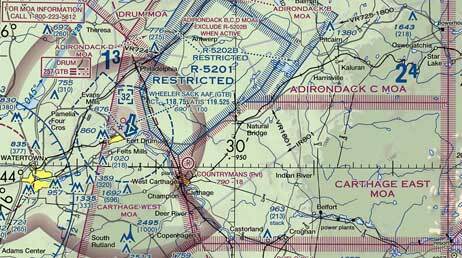 In the Northeast, "preferred" IFR routes avoid Restricted Areas altogether. Warning Area. Warning Areas contain the same type of activity as Restricted Areas. But they are over the ocean in international territory, so the FAA doesn't have the authority to restrict the airspace. Take the warning seriously – you're putting your life at risk if you fly there. Military Operations Area (MOA). These areas are established to separate military traffic from IFR civilians. Military aircraft may be flying acrobatics (dogfights), at very high speed or low altitude, or some combination. Unlike in Restricted Areas, military pilots do obey FARs in MOAs – but sometimes, just barely. VFR flight is permitted in MOAs, but radar following is strongly advised. Generally, if an intruder (you, without coordination) is detected inside an MOA, the boss will call to "knock it off." The military pilots go somewhere safe until the intruder is gone, and they may be able to resume their exercise when the area is clear again. Maybe the exercise is so complex that they have to start again, another day. Either way, the cost is very high. If you pay taxes, consider this before you decide to fly in an active MOA, just because you can. In the table in the chart margin, if only one number is in the ALTITUDE column, it's the floor of the MOA. Alert Area. These are areas of intensive student training, kind of an "MOA Light." For example, A-220 near McGuire AFB is used to train pilots on aerial refueling and other types of formation flying. The military aircraft are not hard to see and avoid, but there are more of them than you would see in other places. National Parks, U.S. Fish and Wildlife areas, and U.S. Forest Service Wilderness and Primitive Areas are marked with this boundary: . The FAA requests that pilots fly at least 2000 feet above ground in these areas. In some parts of the country, the Fish and Game Department does not consider this a request. If they catch you there, fines start at $10,000. ADIZ. The U.S. Air Defense Identification Zone is marked with a special symbol. You may cross this line outbound any time – fish spotters do it every day. To cross the ADIZ line inbound, you must be on an active IFR or D-VFR flight plan. That flight plan must include a remark that tells exactly where you will cross the ADIZ, and exactly when (±15 minutes). 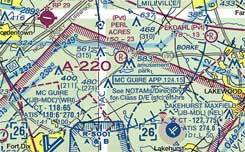 By default, the floor of U.S. controlled airspace is 1200 feet AGL. In some areas, the controlled airspace floor is not standard. There, its boundaries are shown by "zipper" lines, and the floor is given explicitly. 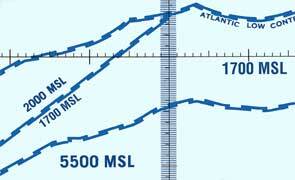 The airspace above the floor is usually class E, but not always – it's class A above 5500 feet, over the ocean. If you want to fly directly from Cape Cod to Nova Scotia, you must be IFR above FL055, with your altimeter set to 29.92. Charted Restricted Areas are established by Congressional rule making and published in the Federal Register. For emergencies, temporary restricted areas may be established by direct order of the FAA. These are published as FDC (Flight Data Center) NOTAMs, which are regulatory. The intent was to protect things like firefighting operations, law enforcement for criminal pursuit, etc. You can sort the list by clicking the column headers. This is useful if you'd rather see the listing by states instead of by most recent NOTAM. 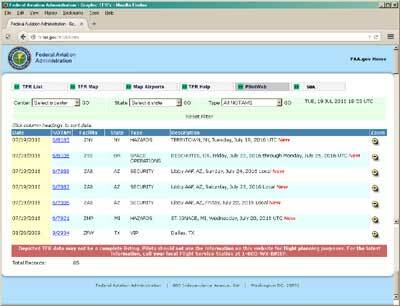 The FDC NOTAMs for TFRs are usually rather lengthy, with a high ratio of boilerplate to flight information. When you click the link, you'll get a new window that usually has the flight information extracted, and a graphical representation that shows the restricted area on a piece of the sectional chart. One of the most difficult of these NOTAMs for compliance has been the so-called "stadium TFR." It's repeated here for illustration only, with the useful text highlighted. Unfortunately, there is no plain-language interpretation available on the FAA web site, and no graphical depiction of the restricted area. A plain language explanation follows this box. High-profile sporting events generate temporary Restricted Areas, 6 NM across and 3000 feet high. There is an exception for aircraft in contact with ATC. Some facilities are more liberal about this than others. One of the more difficult aspects of thie TFR is figuring out where to find the centers of these TFRs. There is a new chart symbol to help with this, a diamond that shows where these places are. The chart legend calls this an "intermittent TFR site."